Tiwi Street names are largely taken from the names of pastoral properties (stations) in the Northern Territory. Dripstone Middle School is the prominent feature of this residential suburb located between the hospital, Trower Rd. and the Casuarina Beach. In 1974 when Cyclone Tracy destroyed much of Darwin this was one of the new suburban areas being developed as the city grew. 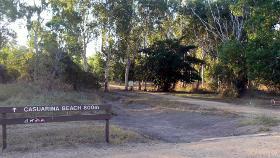 The Casuarina Coastal Reserve can be accessed by road and walking tracks from Rocklands Drive and the Hospital area and is a popular recreation area for Darwin people. Calvert Street Calvert Hills Station, which was first leased in 1893 and named after James Calvert, one of the men in F W L Leichhart's 1844-45 expedition. Glencoe Crescent Named after Glencoe Station, the first pastoral station in the Top End which was stocked in 1879. It is now called Ban Ban Station. Kapalga Street Named after an old mission station on the South Aligator River whichlater became a pastoral company. Koolpinyah Crescent Koolpinyah Station which was first leased in 1908 by the Herbert Brothers. Roper Street After Roper Valley Station in the Roper River region, which was named after John Roper, one of the men in F W L Leichhart's 1844-45 expedition. Wangalara Street Wangalara Station was first leased by Andrew Broad in the early 1880's, but which is now part of Arnhem Land. The name Tiwi comes from the word Tunuvivi which was the original name of the Aboriginal people of Melville and Bathurst Island.